Theme/inspiration: City of trees audio exhibition, National Library of Australia. Clare’s design theme was ‘Under the canopy’. She prepared a bold and colourful design, suitable for welcoming visitors at the entrance of this exhibition, suiting the ambience of the library – ‘neat and ordered, parallel design style, similar to books on a library shelf’. Her design represents the growth, diversity and prosperity of Canberra, under the sheltering canopy of trees and her vertical parallel design evokes the planned landscape of Canberra. Clare used bundles of spear grass to represent tree trunks and Gypsophila ‘Million Stars’ to signify the million trees planted 100 years ago. Underneath the canopy, Clare has placed three blooms of the largest wildflower, the king protea, to represent Canberra as leading the way as our capital, and rows of waxflower, leucadendrons, Banksia and gum nuts to represent the people of Canberra. Contrasting colours were chosen to signify that, together, these floral elements represent Canberra’s bright and prosperous future. Event/inspiration: The ‘Fireside Festival’ held in mid winter. Akemi was inspired by this event to create a cosy fireplace arrangement. She imagined a couple enjoying dinner and wine near the fireplace which provides a relaxing and cosy atmosphere, perfect for a romantic evening together... Akemi made a vibrant arrangement to represent a fireplace: a base of twisted driftwood enclosing warm colours of red and yellow, with pale green flowers and foliage to complement them. The vivid red of the central waratahs represents the core of the fire. 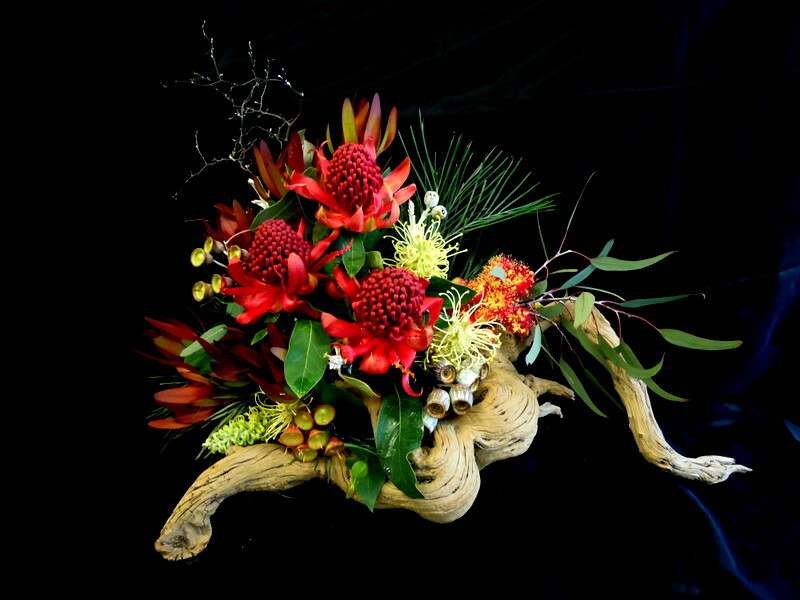 As the red waratah is ‘the symbol of love’ from the dreamtime legend, it symbolises the couple’s emotion as well. 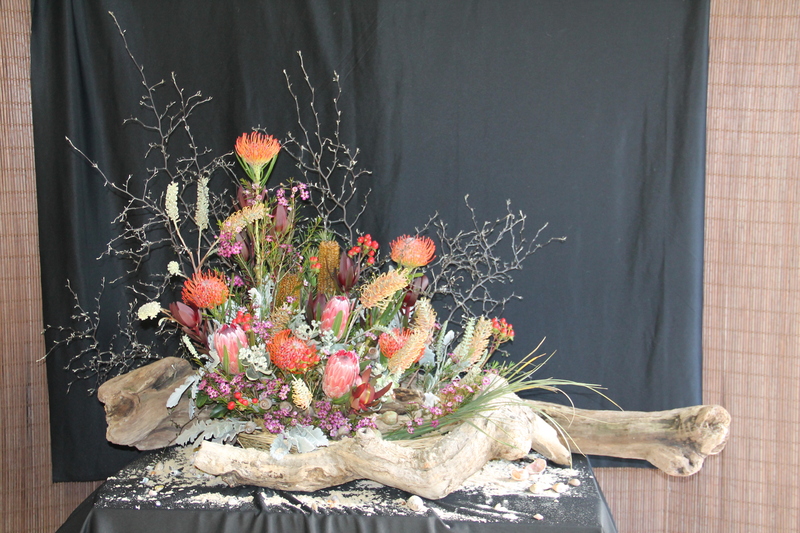 Akemi also liked how the twisted driftwood helps to show the strength of the wildflowers’ vital energy. Event/inspiration: A design for the Gallery Australia venue of the Canberra centenary launch of Landscape Architecture Australia. In her interesting design, Christine used the strong upright forms of various wildflowers to signify the tall, upright shapes in and near the Gallery – the angled ceiling of the Design Gallery itself, the Canberra carillion, and ‘Haus’ – a cast concrete picnic setting with a striking mosaic interior. 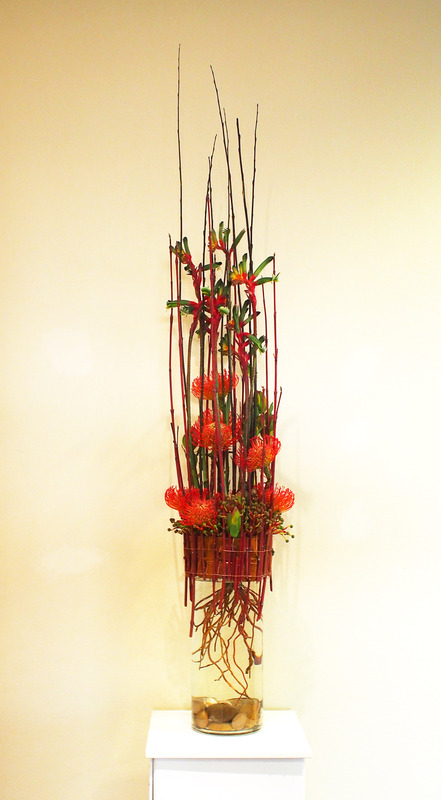 Designing her arrangement to be placed in front of a column in the high ceilinged gallery, Christine has used tiers of tall elements: three Gymea lily stems have been highlighted with bindings of blue, grey and black wool to link to the mosaics of ‘Haus’, and three types of banksias accentuate height. Christine included exotic species (cherry plum branches and ivy) to signify that historic and contemporary Canberra landscape designs have featured exotic trees, shrubs and groundcovers. Event/inspiration: ‘City of Trees’ exhibition, an immersive installation of photography, sound and drawings exhibition at the National Library of Australia. 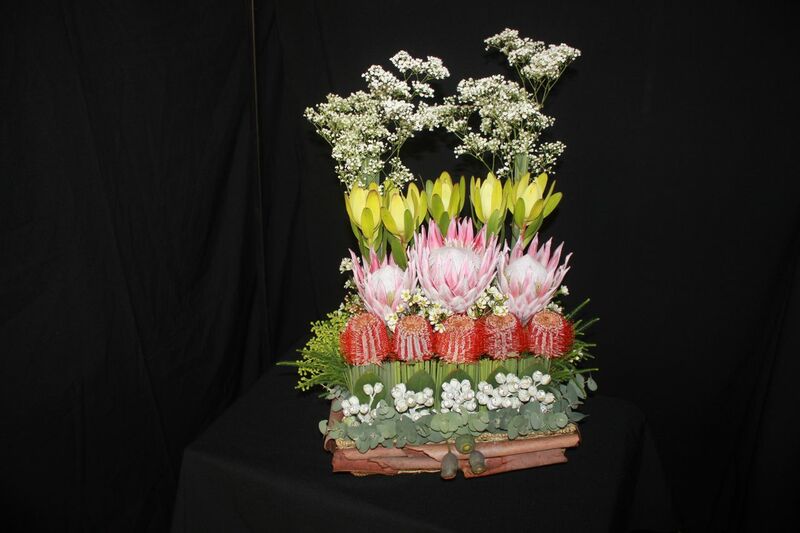 Eunice designed this simple but striking arrangement to suit the atmosphere of the exhibition and venue. Her concept is a visualization of trees and their growth over time, supported by their strong roots deep within the soil, which has ecology of its own. Because the exhibition commemorates the centenary of Canberra, Eunice chose to reflect the passing of time and history, starting from the layers of rock and sediment in the ‘below’ which give way to the life that we see today. Canberra has also evolved over time in this same way. The tall, outstretched branches in her arrangement signify future growth and potential. The complimentary colour scheme was chosen to express a tree’s strength and also to emphasize a feeling of celebration. The split complimentary colours red-orange, red-violet and green comprise the main colour scheme. Eunice used the complimentary red and green for accent. Event/inspiration: “People of the mountains and the sea” by Monaroo Bobbera Gdu. In her design, Ikue wanted to capture the scenery where the beautiful Australian bush and ocean meet. She aimed to have the design give an expression of the openness of the space, while also expressing a sense of freedom and a celebration of our country, Australia.